Two new solar farms which are generating electricity to power a council office and sell back to the grid were officially handed over at a launch event in Yate this week. The new solar technology was installed and connected earlier this year and features a 245.52kWp system of 790 panels on land next to the council offices in Badminton Road, Yate (pictured) and a larger 748.65kWp installation on council owned land in Moorend. Taken together, the solar panels are expected to generate approximately 950 MWh/year of carbon-free electricity, which is equivalent to the amount of electricity used by roughly 230 average-sized houses in South Gloucestershire in a year. Additionally, they will deliver estimated savings of £10,000 from the council’s annual energy bills through lower electricity costs as well as contributing approximately £55,000 a year in revenue from Feed-in Tariffs. 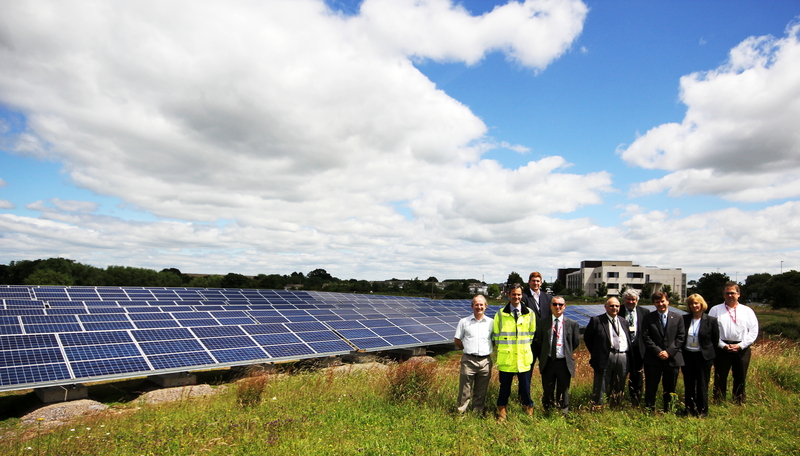 Speaking at the launch, Councillor John Goddard, Chair of the Resources Sub-Committee, said: “Our investment in solar at Badminton Road and Moorend is the latest of a series of measures to make our estate more environmentally friendly and demonstrates the council’s commitment to green energy. The heating for the Badminton Road office is provided by a biomass boiler burning sustainable wood chips and we have installed renewable energy schemes in a number our other buildings and schools. The solar farms were installed by Benu Energy in conjunction with their partner Ikaros Solar. Representatives from both companies joined Cllr Goddard and council staff at the official handover event.